When I was looking after Mom I looked often at this picture which hung on her wall. 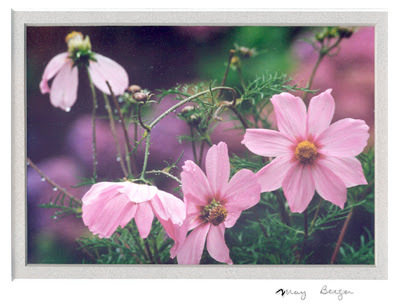 I had photographed these cosmos flowers a few years ago in the rain and the water droplets make me think of tears. It’s kind of a sad picture, but it’s beautiful as well. There is a beauty in some sadness, don’t you think? I think that sadness wrapped in love is a beautiful thing, because love is beautiful. And love comes from God. To lack that sadness would not be beautiful at all. There is a kind of gentle richness – a bitter sweetness – when someone has lived a long life and then closes that life. There was a bitter sweetness about spending those last weeks with Mom, hearing her last precious words. One thing she expressed a lot was her gratitude to my husband and I and to others for looking after her at that time. I’m so glad we were able to do that. There is also a kind of beauty in the sadness I feel surrounding my friend going away for two months. This, too, is a sadness clothed in love. And if you love deeply, you hurt deeply.